Initial commissioning efforts for the Main Injector Collimation System have reported that about 93% of the loss due to uncaptured beam was deposited in the collimation region (LM229 - LM309) with an additional several percent in the region just beyond the pre-defined collimation region (LM310 - LM315). This was based on the integrated loss for $23 cycles (mixed mode PBar and NuMI) between 0.755 seconds and 0.829 seconds (74 ms). 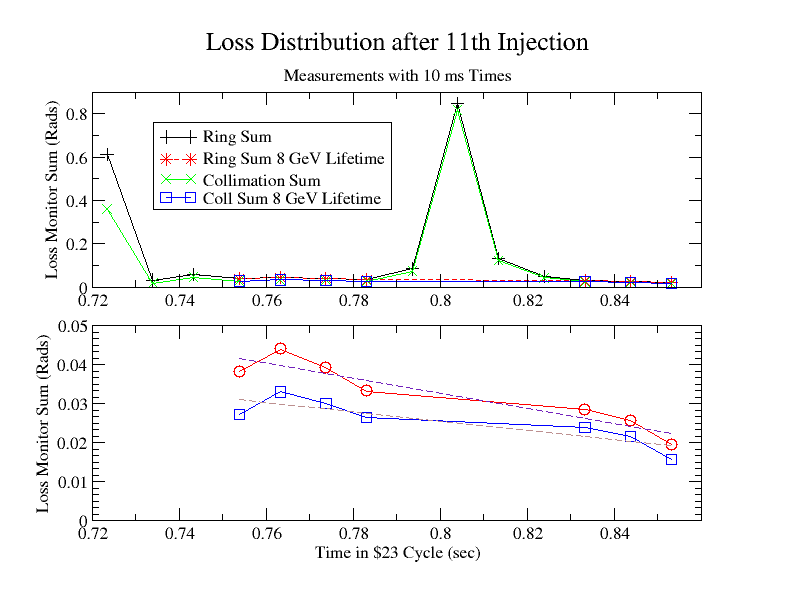 This document reports on measurements which explore the time structure in this region and find that slow losses (8 GeV lifetime) are significant. Measurements during the ~12 ms of uncaptured beam loss show an efficiency of about 97% in the collimation region with an additional 2% in the next few loss monitors. We obtain this result either by determining the slow loss and subtracting it or by simply focusing on the appropriate time interval when the background is almost negligible. We conclude that further collimation optimization needs to emphasize stable operation for uncaptured beam while exploring better collimation efficiency for injection and 8 GeV lifetime processes.